Beautiful hike up Indian Head Peak from Meander Meadow yesterday through meadows of brilliant though nearly barren huckleberry bushes. Apparently the huckleberry crop throughout the northwest is meagre this year so the bears are hungry. We saw one up on Indian Head Peak, scrounging up some berries from a bright red patch around 6000' on the south slope of the peak. It didn't look particularly skinny but we gave it a wide berth and were careful with our food around camp as well. Jeff Zimmerman and I drove over two days ago. We left Jeff's place around 11 on a brisk fall day, stopped at Stephen's Pass to eat our lunches, started up the trail around 3PM and reached Meander Meadow just after sunset. Among the many mushrooms along the trail I found a single Boletus edulis in good condition (there were quite a few others, big ones, but all soft) which we fried in some cheese Jeff had brought because I didn't have any oil. The mushroom was delicious; the fried cheese so rubbery it was nearly inedible. Exceptionally bold deer mice scurried around our cooksite under big firs at the lower end of the meadow; Jeff tossed a chunk of bark at one and to his surprise, hit it and knocked it out. It came to after a bit and staggered off to recover. Its brethren, after a few more close calls, began to show a little more respect as well. We slept in until the sun was an hour or so above the horizon and the morning chill was beginning to dissipate, then we pumped water and fired up the stove for something hot, assembled some lunch and hung whatever else wouldn't fit into our bear cannisters and set out for an adventure. The higher mountains were off to the north out of sight behind the first ridge, so we started by bushwhacking up that ridge. I had in mind hiking north about 5 miles to White Mountain but when we gained reached the ridgecrest and I saw how far 5 miles was on the ground I decided to settle for the closer but still imposing Indian Head Peak. We followed waytrails along the ridge and across the Pacific Crest trail then continued up to Kodak Peak, the high point where our ridge reached the Cascade Crest. We ate a bar or two and sat around in the sun on the flat and well-worn top of Kodak Peak, watching ravens play and hawks fly by and a pipit or two hopping around on the rocks. We also tried to call home but couldn't get a signal. Catching the PCT down in the huckleberry meadows below Kodak Peak, we followed it down to the Saddle and on into the woods before turning off to the right and hiking through steep woods and even steeper meadows up the southwest shoulder of Indian Head Peak. 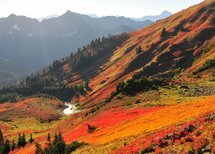 The colors were brilliant - red and orange patches of huckleberry in green-gold meadows with lines of scruffy dark firs along the ridges - but I had a hard time finding good compositions. We hiked up to about 6700' on the west end of the ridge and stopped there for lunch. Afterwards Jeff had had enough of the steep slopes and decided to descend while I continued up the ridge to the summit at 7400'. Beautiful views up there. I called Susan and connected a couple of times but we weren't able to converse, not too surprising since two years ago on Clark Mountain, 7 mi ENE of Indian Head, I wasn't able to get a good cell phone connection until I reached 8000'. I lost track of Jeff but he watched me descending from the summit and we met about where we intended to, down in a hollow on the south slope of the mountain, and hiked back to camp together. We descended the last steep slope down into Meander Meadow at dusk, found our camp intact and fixed our supper under the firs again. The weather was still beautiful this morning as we hiked out; too bad we couldn't stay longer in such a beautiful area. Keith and Wendy hosted a solstice party for their neighbors yesterday evening. Susan wasn't feeling well, still recovering from getting the Christmas presents purchased, wrapped and shipped this past week, so I walked over alone. They fixed a delicious dinner - roast ham, baked salmon, pasta w/ pesto, sauteed chanterelles, red cabbage, pickled beans, a sweet corn mix and perhaps a rice dish, with dark coconut fudge for dessert. Most of the vegetables were from their own extensive garden. Keith does the vegetables, Wendy the flowers and both gardens are the envy of the neighborhood, or if not, they ought to be. Turns out Keith is an avid mushroom collector as well - Chanterelles of course, Oyster Mushrooms, Shaggy Manes, and Matsutakes. I told him about King Boletes and Pom Pon du Blanc (Hericium abietis). Kevin down at the end of the street volunteered that he had magic mushrooms growing in his yard. I forgot to ask him about them when David and I went over there today to try for photos of his barn owls. I've suspected there were barn owls in his barn but didn't know for sure. I've seen them in the area several times over the past few years. Apparently he normally has at least one and sometimes several owls in his barn. This winter he has two, a larger whitish one and a smaller darker one. I was able to get a photo of one of them, the darker one I think. At the party I also talked with Julie, who is doing research on vaccines for malaria and other diseases for a company funded by the Bill and Melinda Gates foundation. She and her husband, whose name I didn't catch, have several goats so we swapped goat stories. John lives across the street from Julie. I'd met him before. One evening when I was running by he was talking with a couple of bow hunters in his driveway. They were after hunting the deer that live in the neighborhood, no doubt the same ones that eat our roses. At the party he told me how he pursued the deer after the bow hunters gave up and though he saw them a couple of times, he never had a clear shot and refused to take a chance on a bad shot. He did succeed in shooting a couple of mallards on Winger Lake, the occasionally-flooded pasture on the east side of our road out towards the main road. That would explain the scarcity of ducks in that pasture recently. The mallards and wigeon are down along 400th instead. A number of people at the party recognized me as the runner, and in particular, the barefoot runner, in the neighborhood. I explained that I had fewer problems with my feet if I did some of my mileage without shoes. Keith mentioned that he too had had problems with plantar fasciitus for a year or so. When orthotics failed to remedy it he'd had surgery and since then it has scarcely bothered him at all. John suggested that I talk with his girlfriend who was coming a little later since she was into running. We did talk, eventually. She likes half marathons, most recently the Tacoma Narrows Half back in August, and is hoping to get John into running too. I think he prefers drinking. A couple of the men were taking swigs out of a flask before the crowd began to dissipate, though no one seemed drunk. Engaged in talking with people, I didn't really notice the crowd thinning out until only a handful of guests were left. Not wanting to be last out, I left shortly afterwards. At home Susan asked me about the decorations and I couldn't remember any. I'd been concentrating on remembering names. The ground is bare in Jackson this Christmas. Around the house there are patches of frozen powder tucked in hollows among the dry grasses and leaves but the fields are brown and straw-colored, the lawns tinged with dull green, the woods carpeted with orangy-brown fallen leaves. There is no local cross-country skiing though areas to the north and west have a little snow. Instead of skiing, we've been skating. Heavy rain a couple of weeks ago melted what snow had accumulated and saturated the ground, then cold weather re-froze the lakes as well as all the puddles and seeps in the woods and fields. Our first glimpse of the ice was on Lake Chocorua as we drove north from Boston after breakfast with Silas at the Miss Wakefield Diner. That was actually our second breakfast. We'd eaten our first breakfast at the Ball Square Cafe in Somerville where we ate two years ago when we arrived the morning after a snowstorm. Susan and I had omelettes, Daniel had a chocolate waffle and David had pancakes. I'd remembered it as Bell Square so it took several minutes to locate it on my phone. Once we found the place, the phone directed us to it with directions spoken in a mechanical voice while we drove. Susan's carmelized onion and goat cheese omelette was better than my roasted vegetable omelette but we'd definitely go back there again. Silas was driving south in his new truck to pick up Susie at the airport. We thought we'd spot him but he drove past us a few miles south of the Miss Wakefield and was nearly to the toll highway by the time we called him from the parking lot. Daniel and I split some potatoes and vegetables and Susan and I had coffee in the diner with Silas. We drove by the first turnoff at Lake Chocorua then turned around when Susan and David had no objections to our stopping for a few minutes. I tested the ice first and it seemed solid beyond an intermittent ribbon of open water right along the shore. Daniel and I ventured out, walking and sliding on the smooth gray ice. What we needed was skates. David and Susan were amenable to another delay so we drove into North Conway and rented two pair of hockey skates at Joe Jones for $20 then returned to Chocorua. A snow flurry had blown through and a cold breeze, still spitting snow, was driving lines of powder across the ice. Skating before the wind we just flew across the ice, blades chattering on the bumps, but coming back the snow stung our faces and we we had to work for every stride. We skated until our photos turned blue in the fading light then stumbled ashore and drove the rest of the way to Jackson. Daniel skated at Crystal Lake the next day. The ice was smoother than Chocorua but yesterday's flurry had left little drifts of snow over most of the lake, no problem to skate around going forward but just enough to trip me up when I tried to skate backwards. We skated down to the end of the lake and back then back and forth from side to side. Daniel did a lot better than yesterday but still couldn't keep up with me on a straight run, though when we tried doing figure 8's riding on one edge all the way around he made it as far as I did, which was just short of completing it. Christmas eve we didn't have much time for skating so we went to Echo Lake, the closest ice to Jackson. The sun was shining in a blue sky and the lake was a pale green disk of glassy ice sitting in the pine woods below Cathedral Ledge. We put on our skates on a sandy beach near the gated entrance to the state park and skated across to the far end of the lake. Looking back we saw only our own two sets of tracks etched in the ice. We had just a half hour so we made the most of it, laying sinuous tracks by alternating left and right crossovers, riding single edges halfway across the lake then racing around in circles then touring around the edge of the ice, startling yellow perch sunning in a little patch of open water along the shore. Today, short of time because Joe could only spare the cousins from two to four, we drove down to Echo Lake again. What a difference a day makes! Where we'd left first tracks yesterday the ice was so cut up it appeared to be dusted with snow. Though a pick-up hockey game was in progress at the far end of the lake and a couple parties of skaters were dodging lumps of ice at our end, the whole middle of the lake towards the far shore was available and still reasonably smooth so we occupied it. Rose, into photography now, walked out with us and took pictures with her D3000. David put on skates for the first time and within fifteen minutes and a little coaching from Daniel, had figured out how to stop and go and even turn on demand. Susan and I were delighted that he ventured to try skating and even happier that he enjoyed himself doing it. Kirsten carved graceful turns and Silas charged down the ice in headlong sprints. Daniel and I were somewhere in between. I fell once when one skate dropped down into a crack and stopped moving forward while I did not. I landed fairly hard on my palms but my wrists were OK and the soreness in my upper back didn't seem to be much affected. I slipped on some ice a couple of days ago while I was out running on the golf course. Though I fell sideways I managed to twist around and land on my chest, cushioning my fall with my balled fist. I felt a little crunch in my upper back and a twinge of soreness somewhere between my spine and my left shoulder blade. I fell again at Crystal Lake, landing hard on my hip, and this time the little crunch seemed to run down my back from my neck to my waist. Since then it's been getting more sore every day, to the point where it hurts to take off my slippers and hurts to breathe deeply and hurts even more to cough or blow my nose. It bothers me mostly in the evening when the surrounding muscles seem to tighten up, though even then it doesn't hurt if I don't provoke it so I haven't so far taken anything for it. Yesterday was a busy day, particularly for Susan as she did much of the food preparation for Mom and John's annual Christmas Eve party. That went really well and quite a few people stayed around for an hour or more, standing around drinking and talking and nibbling on cheese or sandwiches. I took photos in my awkward way but some of them came out OK. Susan disappeared upstairs for the first hour and a half of the party then came down and enjoyed some interesting conversations with Kirsten's boyfriend's mother and Silas's girlfriend's father, among others. We cleaned up a little before church and more after the candlelight service, then wrapped presents until nearly 2AM so it was a short night. This morning we ate the traditional Swedish-flavored breakfast down at Sarah and Roger's and opened the stockings Susan had stuffed for us all before returning to the house for the main event, opening the nearly 200 presents stacked around the tree. We had to hurry a bit because the kids were due at Joe's at noon, but by multithreading the present-opening, we completed the job ahead of schedule, if not exactly within budget. Dinner was up at Joe's and where we were expected at 5:30 but Susan and I stayed behind while she made our loaf and gravy, so we didn't make it until after they all had started eating. That wasn't a problem and we had a nice dinner. I struggled to stay awake afterwards but Susan was full of energy and had a great time laughing with the kids at their table. I suspect she'll need a couple days off to recover from all her work the past two days - she has really put everything together for the rest of us this Christmas. Last day of skating today - a snowstorm is forecast for tonight. Sarah and I took the boys and cousins (except for Bridget) down to Conway Lake. Though there was some open water in a few places, particularly along the channel we follow out to the main lake from the beach in Center Conway, the ice overall was smooth and though dark, was plenty thick enough. I chopped a hole with my skate blade in some of the darker ice out in the middle of the lake. Judging by the appearance of cracks and bubbles in the ice I'd estimated the thickness at about 3" but it turned out to be twice that, which was reassuring. We skated out around the point then south about a kilometer to some islands. David and Rose skated along the east shore with Silas, Kirsten and Sarah while Daniel and I crossed to the west shore and north about a kilometer before returning to meet up with the others. Sarah had to leave but we had another hour before we had to take Silas back to North Conway, so Daniel, David and I skated back across the lake to the west shore and up into the northwest corner of the lake, exploring little coves and bays, marveling at the pressure ridges buckling the ice between some of the islands and the shore, practicing our technique and visiting with other skaters out on the lake. David was much improved today and though not able to skate as fast as we do, kept up with us comfortably in our explorations. I can barely keep up with Daniel and Silas now, but on the other hand I can skate nearly as fast backward as forward and twice made it halfway across the lake going backwards. I also managed to complete crossover circles backwards in both directions. It was wonderful to have such an expanse of clear ice. The surface was slightly roughened by the remnants of the large crystals formed as the water first began to freeze but other than widely scattered shallow patches of windblown snow, there were no obstructions of any kind to trip us up. It's been a few years since we've happened to be in Jackson during a good snowstorm. This was a classic northeaster which moved up the coast and out over the Gulf of Maine, dumping 25" in New York City and about half that from Boston north and east along the coast. We received about 6" overnight and another 2 or 3 during the morning with north or northeast winds gusting to about 30mph. Not quite a blizzard but exciting nonetheless. I went tramping around in the woods in the afternoon scouting for birds for the North Conway Christmas Bird Count tomorrow. I followed ski trails from 16B beyond Burgess's down to our fields then back home, but with the wind roaring in the treetops and the branches clattering together, I didn't hear a single call. I did much better with the birds today than yesterday. The wind blew hard overnight and drifted the snow around some more but in the morning the sun was shining in a bright blue sky and though the wind was still gusting up now and then, the air temperature was not much below freezing. I walked over to Cameron Drive and after stopping by Lynn and Al's to find out what was at their feeder, I went next door to Mike Maiorano's and got his permission to sit next to his driveway and watch his feeders. That's where the birds were - a dozen or more Blue Jays, at least a half-dozen chickadees, a couple of crows in a nearby tree, a white-breasted nuthatch and just a glimpse of a secretive male cardinal. Near the end of the road I photographed a redpoll, probably the same one I saw down there several days ago with Mom and John, feeding on birch seeds. Though I walked around the Eagle Mountain House golf course and up along the brook, I didn't find much else other than the Ruffed Grouse I flushed from a fir balsam thicket near the Maiorano's. That proved to be the only Ruffed Grouse reported for the North Conway CBC, so I felt good about that. In the afternoon I walked through the woods from Sugar Hill Lane up to Burgess's, then up into the woods on the lower slopes of Black Mt over to Overlook but I found only a flock of chickadees and a couple more nuthatches at John and Mary's feeder. They'd seen 4 Wild Turkeys earlier that afternoon so I included those in my report down at the Tin Mountain Center after sunset. I met Chris Lewey there, and Leslie Rowse whom I'd known in high school in Marblehead. She was a friend of Fran and April's whom I don't actually remember, but I enjoyed talking with her this evening. She's a wildlife biologist for the White Mountain National Forest, works with Joe up in Gorham. I also met Lori, who is the compiler for the Jackson section of the CBC and knows Mom and John. There were a couple dozen people at the compilation meeting at the Tin Mountain Center; I had no idea there were that many birdwatchers in the North Conway area.